I cannot express how sad and empty I feel for the passing of my mother Elizabeth. Everyone was shocked at how soon it all happened. I think even I, who was with her during her last hours, minutes, seconds, am still in disbelief that she's no longer with us. Mommy was diagnosed with Stage 4 Gallbladder Cancer last April 30. Less than two months after it was discovered, she rested peacefully. She fought a good fight. Mommy is known as a strong woman, a fighter in every sense. If there's any consolation, the Lord God didn't let her endure too much pain and He didn't allow her to be agonized for a long time. Although for us whom she left, it was all too soon. I was always asked this question: What were the symptoms? Why was it discovered too late? Couldn't surgery be done? Chemo? Sadly, when it was detected, the doctors couldn't do anything anymore. What we could offer her was just comfort that she's taken care of round the clock in the hospital and is under pain management. Mommy was active she was with her aerobics, church activities, barangay lupon duties and senior citizen organization. She led a healthy and active lifestyle, she was always happy, she always accomplishes amazing things at home and in our community. 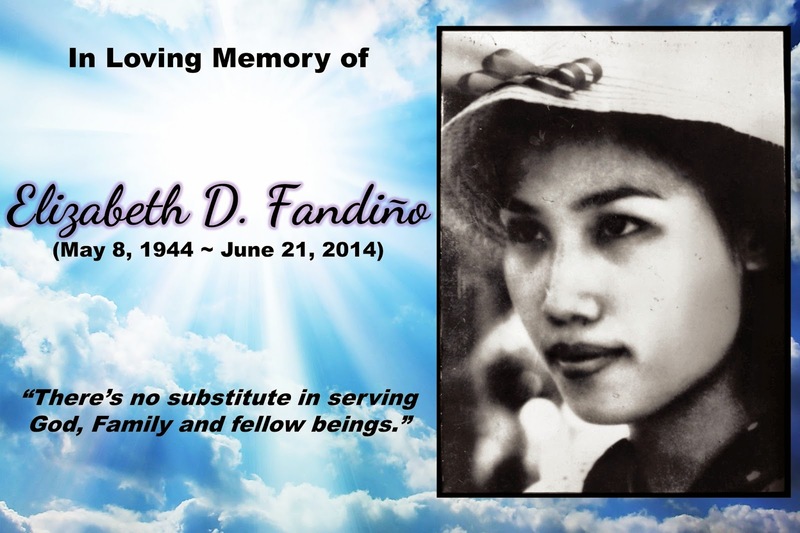 She's well-loved and had left a mark in the hearts of many and in the organizations she's part of. People she was close with tell me now how much my mommy loves me and how proud she was of me in everything I do for my family, at work and my other activities. That my mom tells them a lot about me, that I am her "bukam-bibig." Each time I hear them tell me those things, I feel sad that I couldn't do anything anymore for her. I feel that KULANG PA ang mga nagagawa ko para ibalik ang lahat ng pagmamahal at nasakripisyo niya for us. 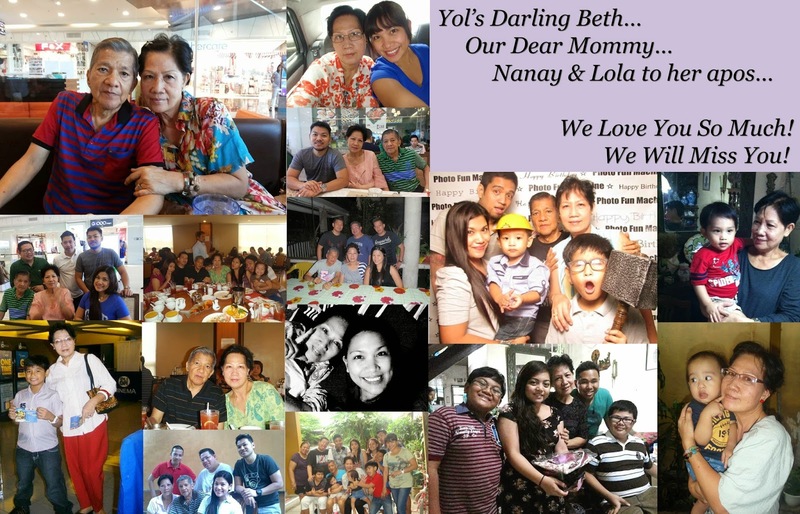 For everything she has done for me and my children, what I've done and returned to her will always be NOT ENOUGH. I don't really regret not being able to show her how much I love her nor not being able to take care of her nor do lovingly service to her. I just wanted to DO MORE for her. My relatives and her friends say, not to feel sad anymore because my mom knows how much I love her. They said, mommy surely felt that more especially when she was in the hospital. Still, I want to do MORE Mommy... for you. I will forever be in debt for my life and what I've accomplished while living it. How can I repay you some more Mommy? I guess I'll know the answers in the coming days, weeks, months and even years. For now, I pray for MORE acceptance and for strength. She has served our parish church for 20 years and as the priest said in the mass yesterday, Mommy is now directly serving God in heaven together with the angels. Her work here on earth is done. The Lord has called her to fulfill a different role in heaven, to be our dear ANGEL. Thank you Mommy for everything. I will forever and ever miss you. I love you very much Mommy. I know you're in a better place now. Rest In Peace. hugs, Louise. I can't imagine your grief right now. If I may say, you look exactly as your mom in that photo. Thank you Sarah for your kind words. Thank you for lifting my spirit up. God bless you and your family always! Hello @Nerisa, that's what everybody said, that I look like mom in that photo of hers taken in 1965. :) God bless dear! My sympathy's with you, Louise. I pray for strength and courage for you to move on. God is in control.